Optus MVNO Yatango Mobile is attempting to attract deflecting Kogan Mobile customers, offering them a free 30 day trial that provides the same 6GB of data and unlimited voice calls and SMS as the soon to be defunct network. The company has negotiated an exclusive deal with Kogan Mobile, contacting all of its customers by email yesterday advising them of a free, unlimited offer that lasts 30 days. The email includes a unique coupon code to redeem the free trial through Yatango. 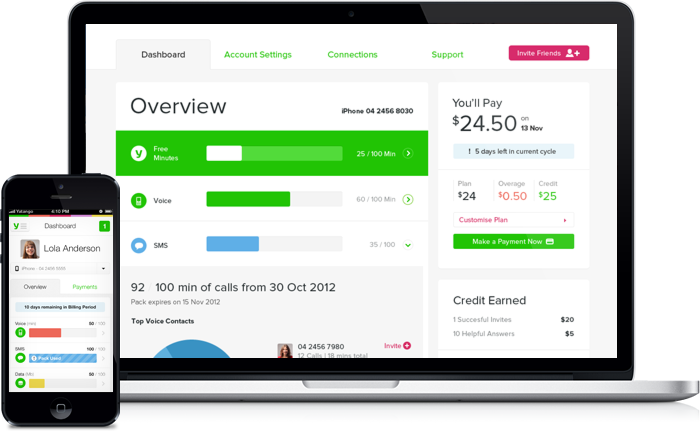 Following the free 30 days, Yatango Mobile says it will "build a flexible month-to-month plan" for Kogan customers. Yatango's slider-based online interface allows its customers to build their own personalised plan, so users can adjust the amount of voice minutes, SMS messages, mobile data and international voice minutes every month. The 'packs' of voice, SMS and data have a 30 day expiry but can be reconfigured at any time, month to month, with no lock-in contracts. The Yatango Mobile offer to Kogan Mobile customers. However, the Yatango plans are significantly more expensive than Kogan Mobile. As an example, 200 voice minutes, 200 SMS messages, and 3GB of data will cost $39 per month. Despite the higher prices, Yatango Mobile's founder and CEO, Andy Taylor, said that many customers simply need to better understand their usage. "We encourage Kogan Mobile customers to continue to challenge the status quo and seek out providers that help them to understand their usage - once you understand your usage, you can save money. Our data shows that 90 per cent of customers who switch to Yatango stand to save money." "Australian mobile customers need to know that they don’t have to accept the inevitability of overspend or ‘devil in the detail’ of traditional operators. There are other options available that offer greater simplicity, control and transparency." Yatango confirmed any Kogan Mobile customers who take up the free 30 day trial will be provided with a summary of their mobile and data usage at the end of the month. The company will also recommend a personalised plan based on usage. Yatango only launched in Australia earlier this year, and like Kogan Mobile, is purely a BYO mobile, SIM-only network. The MVNO currently offers a 3G-only service on the Optus network, but promises that 4G will be available "in the coming months."